Titoki Alectryon excelsus, copyright Tatters. 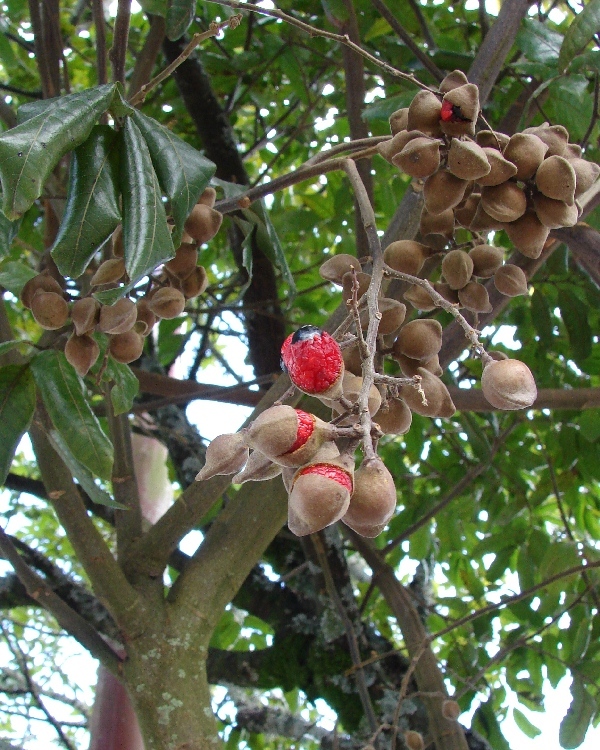 Contains: Anacardiaceae, Burseraceae, Rutaceae, Meliaceae, Simaroubaceae, Acer, Dodonaea. The Sapindales are a clade of flowering plants whose members often accumulate noxious secondary metabolites. Members include the Sapindaceae, a family of woody plants with often spiral, pinnately-compound leaves with subopposite leaflets and a terminal rhachis tip (Angiosperm Phylogeny Website). The Aceroideae (containing the maples) and Hippocastanoideae (horse-chestnuts) have each been treated as separate families by some authors. 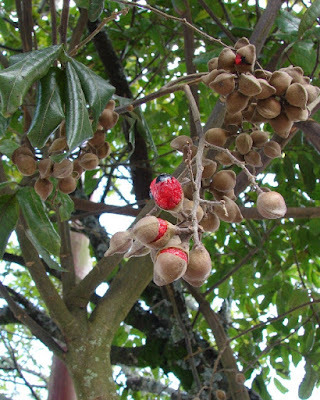 Aceroideae have fruit that are samaras, with seeds contained with nutlets attached to a fibrous wing. Fruits of Hippocastanoideae are capsules that dehisce into three valves. Characters (from Angiosperm Phylogeny Website): Interesting secondary compounds, ethereal oils, myricetin present; mucilage cells present; branching from previous innovation, petioles leaving a prominent scar; leaves spiral, odd-pinnately compound, leaflets opposite, vernation conduplicate; inflorescence branches, at least, cymose; twice as many anthers as sepals; tapetal cells polyploid; nectary well developed; carpels equal to and opposite petals, or 3, odd member adaxial, stigmatic head from postgenitally united free carpel tips; ovules few/carpel, epitropous, nucellar cap present; exotegmen not fibrous. [A-R03] Acevedo-Rodríguez, P. 2003. (1592) Proposal to conserve the name Tina (Sapindaceae) with a conserved type. Taxon 52: 373–374. [BR65] Black, J. M., & E. L. Robertson. 1965. Flora of South Australia. Part IV. Oleaceae–Compositae. W. L. Hawes, Government Printer: Adelaide. [B04] Brown, B. V. 2004. Revision of the subgenus Udamochiras of Melaloncha bee-killing flies (Diptera: Phoridae: Metopininae). Zoological Journal of the Linnean Society 140: 1–42. [B56] Brown, R. W. 1956. New items in Cretaceous and Tertiary floras of the western United States. Journal of the Washington Academy of Sciences 46 (4): 104–108. [C16] Cambage, R. H. 1916. Notes on the native flora of tropical Queensland. Journal and Proceedings of the Royal Society of New South Wales 49 (3): 389–447, pls 57–61. [D07] Dash, S. S. 2007. Useful plants of Kabi Sacred Grove, Sikkim. Bulletin of the Botanical Survey of India 49 (1-4): 79–88. [DD06] Doty, J. B., & R. C. Dowler. 2006. Denning ecology in sympatric populations of skunks (Spilogale gracilis and Mephitis mephitis) in west-central Texas. Journal of Mammalogy 87 (1): 131–138. [F11] Fraga, R. M. 2011. Family Icteridae (New World blackbirds). In: Hoyo, J. del, A. Elliott & D. A. Christie (eds) Handbook of the Birds of the World vol. 16. Tanagers to New World Blackbirds pp. 684–807. Lynx Edicions: Barcelona. [GT02] Gomez, B., F. Thévenard, M. Fantin & L. Guisberti. 2002. Late Cretaceous plants from the Bonarelli Level of the Venetian Alps, northeastern Italy. Cretaceous Research 23: 671–685. [H11] Hilty, S. L. 2011. Family Thraupidae (tanagers). In: Hoyo, J. del, A. Elliott & D. A. Christie (eds) Handbook of the Birds of the World vol. 16. Tanagers to New World Blackbirds pp. 46–329. Lynx Edicions: Barcelona. [MB08] Maiden, J. H., & E. Betche. 1908. Notes from the Botanic Gardens, Sydney. No. 13. Proceedings of the Linnean Society of New South Wales 33: 304–319. [MM96] Mound, L. A., & R. Marullo. 1996. The thrips of Central and South America: an introduction (Insecta: Thysanoptera). Memoirs on Entomology, International 6: 1–487. [MS06] Muellner, A. N., V. Savolainen, R. Samuel & M. W. Chase. 2006. The mahogany family "out-of-Africa": divergence time estimation, global biogeographic patterns inferred from plastid rbcL DNA sequences, extant, and fossil distribution of diversity. Molecular Phylogenetics and Evolution 40 (1): 236–250. [R96] Righi, G. 1996. Colombian earthworms. Studies on Tropical Andean Ecosystems 4: 485–607. [T00] Thorne, R. F. 2000. The classification and geography of the flowering plants: dicotyledons of the class Angiospermae (subclasses Magnoliidae, Ranunculidae, Caryophyllidae, Dilleniidae, Rosidae, Asteridae, and Lamiidae). The Botanical Review 66: 441–647. [V72] Voss, E. G. 1972. Michigan Flora. Part I. Gymnosperms and Monocots. Cranbrook Institute of Science and University of Michigan Herbarium. [W01] Walter, D. E. 2001. Achilles and the mite: Zeno’s paradox and rainforest mite diversity. In: Halliday, R. B., D. E. Walter, H. C. Proctor, R. A. Norton & M. J. Colloff (eds) Acarology: Proceedings of the 10th International Congress pp. 113–120. CSIRO Publishing: Melbourne. [WM09] Wang, H., M. J. Moore, P. S. Soltis, C. D. Bell, S. F. Brockington, R. Alexandre, C. C. Davis, M. Latvis, S. R. Manchester & D. E. Soltis. 2009. Rosid radiation and the rapid rise of angiosperm-dominated forests. Proceedings of the National Academy of Sciences of the USA 106 (10): 3853–3858.